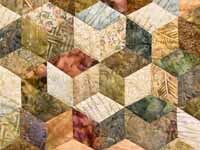 Brilliant combination of fabrics selected by C Jean Horst and a wonderful patchwork design. 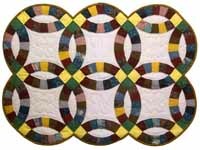 Nicely pieced and quilted by a local Amish woman. Signed and dated. 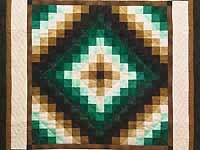 Lovely fabric selections and attractive design. Note the care taken with piecing and quilting. Made here in Lancaster by an Amish woman. Includes a sleeve for a hanging rod. Festive Poinsettia flower. 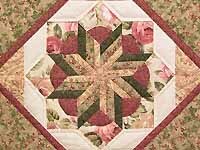 Designed by Arlene with fabric selections by Hannah and made by local Amish woman. 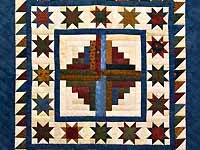 Excellent piecing and quilting. Includes a sleeve for a hanging rod. Classic elegant design with outstanding fabric selections. 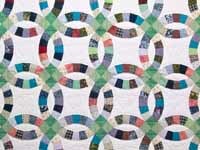 Note the attractive border and sash quilting. Made here in Lancaster by an Amish woman. Includes a sleeve for a hanging rod. 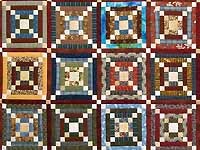 A charming small classic quilt with an attractive collection of cotton prints that can be used as a lap throw or wall hanging. Nicely made by Lancaster County Amish woman. 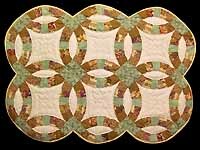 Classic design with terrific fabric selections -- large enough to be used as a throw or wall hanging. Note the lovely hearts! Background is tone on tone cream white cotton print. Well made by Amish woman in her Lancaster home. Wonderful hand painted batik style fabrics selected by C Jean Horst and a great 3-D design! 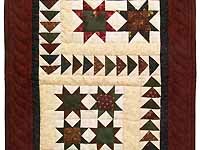 Carefully made here in Lancaster by an Amish woman note the careful piecing and fine quilting. 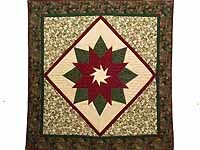 A charming small classic quilt with attractive brown, sage green and rose prints that can be used as a lap throw or wall hanging. Nicely made by Lancaster County Amish woman.